The Stars of Vancouver awards are voted on by readers of the Vancouver Courier. This year Nuba won best Middle Eastern Restaurant in the West Side and Downtown, as well as Best Vegetarian/Vegan Restaurant in Downtown. Thank you Vancouver Courier readers for all your votes and support! View all the other winners here. Attention fans of Nuba and great food! On Thursday, April 12 Edible Canada Bistro will be hosting Chefs Ghian Liwarin and Bakhos Mjalleh of Nuba for a long table event. This evening will feature not only these two extraordinary chefs, but will also be hosted by Edible Canada President and Founder, Eric Pateman. It's sure to be a memorable evening and Vancity Buzz has highlighted the event as the top food events for the coming month! Timbale Hummus with Eggplant Fattah Salad Nuba’s hummus, eggplant, red pepper, olives, green onion, pita crisps Sujuk Tagine spicy lamb Lebanese sausage, tomato, sweet pepper, onion, garlic SorbetFish Sayyadiya with Risotto tilapia fish, white wine browned risotto, onion crisps Nest of Kunafa with Berries and Nuts kunafa dough, keshta, fresh berries Lebanese-style CocktailWine Pairings from Okanagan Crush Pad Tickets are $110 and it starts at 6:45pm at the Edible Canada Bistro on Granville Island. Click here for full details and to purchase tickets. Once again, Nuba has taken home multiple honours in the Georgia Straight's Golden Plate Awards. 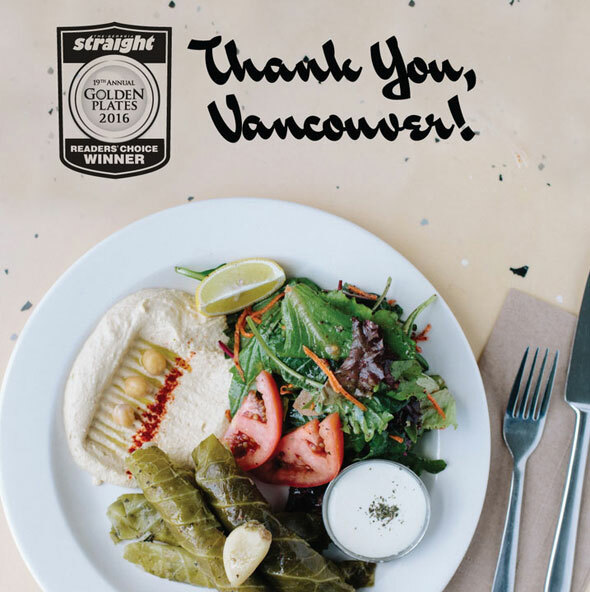 In the 19th annual reader's survey of Vancouver's top restaurants, Nuba was named Best Lebanese and a received runner-up nod in the Best Mediterranean category. Thank you, Georgia Straight readers! Just a heads up that all our locations will be closed on Monday, February 8 for Family Day. Hope you all enjoy time with your loved ones over the long weekend. We'll resume regular hours on Tuesday, February 9. An important aspect of every New Year's Eve is planning ahead. Aside from a safe ride home, it's important to fuel up with food that will give you energy for the long, exciting night ahead. While Nuba in Yaletown is closed on New Year's Eve, our Gastown, Kitsilano, and Mount Pleasant locations will all be open for dinner. So come enjoy our healthy and delicious Lebanese cuisine before heading out to ring in 2016! For reservations at Nuba in Kits call: 604.336.1797 For reservations at Nuba in Mount Pleasant call: 604.568.6727 For reservations at Nuba in Gastown call: 604.688.1655 Have a safe and happy New Year! Local business owners live and provide jobs in your community. Local businesses provide more support for local events, sports teams and charities. Local businesses are more likely to buy local services and can stock local products. Read more about #BCBuyLocal in the Gerogia Straight So when you see a bright pink sticker on your take-out order this week, be sure to snap a photo of it and use the hashtag #BCBuyLocal to let everyone know you support the local economy.